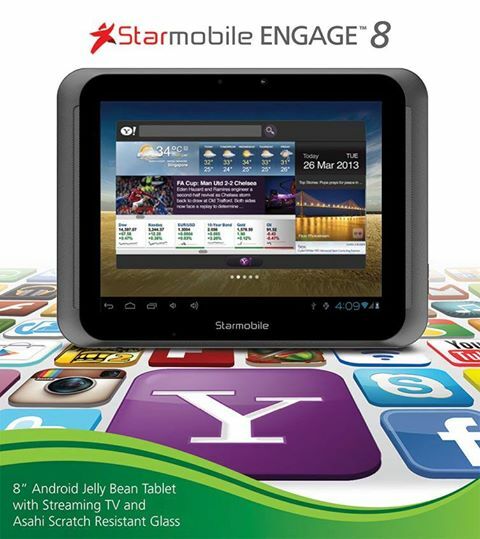 Starmobile now offers another affordable Android tablet that runs on the latest Google OS Jelly bean. The tablet came out in the market after Cherry Mobile release their affordable 8-inch tablet Fusion Wind. Starmobile Engage 8 is the latest tablet from the company with powered up features like 1GB RAM and a dual camera with 8 megapixels on rear and 2 megapixels facing front. Engage 8 measures 8 inches in screen with XGA 4:3 aspect ratio that packages a scratch resistant Asahi Glass. With regards to the price of this tabletit is only few hundred higher that its rival Fusion Wind, Engage 8 price at 6490 pesos while Fusion Wind is only 5999 pesos plus it comes with MF1 Wi-Fi hotspot phone. To help you check the data and specs of Engage 8 just read the specifications provide below. Starmobile Engage 8 is surely worth on what you pay for, you can capture decent photos on its 8 megapixels camera and enjoy video calling with 2 megapixels front view camera that you can for Skype, WeChat and other app. Its processor gives you an assurance that all the task you are doing on this tablet will surely work smooth and fine. Added to that is the 5000mAh battery that can take up 350 hours on standby. If you happen to own or know more about this cool Starmobile Engage 8 tablet, feel free to post you personal review and feedbacks for others to know.